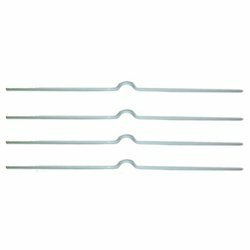 This half moon shaped hanger can be inserted into a double loop wire bound calendar giving a professional finish. Sold in boxes of 100 or 1000 these hangers represent great value. We also sell a variety of calendar punches required for cutting the required shape into your documents ready for hanging. Follow this link for instructions on how to use a calendar hanger, or watch our video. This half moon shaped hanger can be inserted into a double loop wire bound calendar giving a professional finish. Sold in boxes of 50.